One workout, one piece of kit, train your whole body and develop a powerful golf swing! So here is the workout! 1. Explosive Power – Medicine Ball Slam! These are as fun as they sound and look! Stand with feet just outside shoulder width holding the medicine ball in both hands. Extend your body upwards as you reach as high as possible with the med ball. Slam the med ball as hard as you can into the ground! Aim to slam the med ball so it bounces straight back up and you can catch it on the bounce. Squat down maintaining a neutral spine and keeping your chest up. As you push back up and almost reach the start position, begin pressing the med ball overhead finishing fully extended. Start in press-up position but with one hand on the med ball. Perform a press-up in this position and then roll the med ball towards the other hand. Stand with feet shoulder width and med ball in both hands, arms straight. This is basically an upper body rotation with the med ball and chest aligned at all times, going from low to high. Stand with feet shoulder width, med ball in both hands, arms extended. Squat slightly and rotate to the right and face your chest slightly downwards, keep the med ball in front of your chest. Keeping your arms extended and the med ball in front of your chest, rotate and extend your legs as you bring the med ball round and up. Lay on your back with med ball in both hands, arms fully extended above your shoulders and legs in the air, bent to form 90 degree angle. This workout is guaranteed to get your heart pounding and strengthen your whole body with one piece of kit! Perform 3 times per week with at least one rest day between workouts for best results. Watch the video version of this post on YouTube here and don’t forget to subscribe to the channel! Give it a try and then leave a comment below to let me know how you got on! Next Next post: Golf Fitness – 3 Deadlift Variations To Bring Some Power To Your Game! 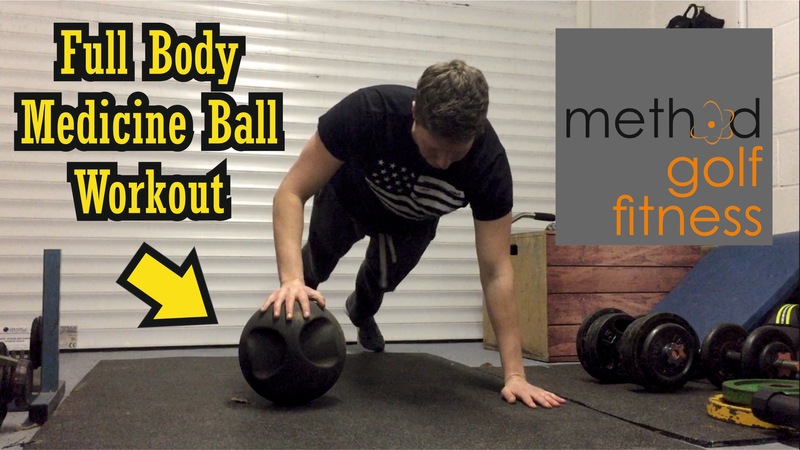 Method golf Golf Fitness – Medicine Ball Full Body Workout!